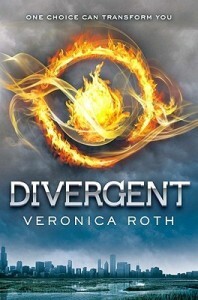 Synopsis (From Goodreads): In Beatrice Prior’s dystopian Chicago, society is divided into five factions, each dedicated to the cultivation of a particular virtue–Candor (the honest), Abnegation (the selfless), Dauntless (the brave), Amity (the peaceful), and Erudite (the intelligent). On an appointed day of every year, all sixteen-year-olds must select the faction to which they will devote the rest of their lives. For Beatrice, the decision is between staying with her family and being who she really is–she can’t have both. So she makes a choice that surprises everyone, including herself. My Thoughts: Abnegation, Amity, Candor, Dauntless, Erudite – fun words, yeah? They’re the five factions that Beatrice Prior and all the other younglings her age get to choose from – they’re the groups of people who will either remain family, become family, or become, basically, enemies. This book… I just don’t know. First of all, the kid’s name makes it seem like the author is trying ever so terribly hard to make sure she’s not just another Jennifer or Kate. Super duper, whatever, but it’s grating. That, obviously, is personal preference and doesn’t really tell you whether or not the book was good. Was it? Well, sure. It was “good” but it wasn’t “great”. The story was fast paced, perhaps, or at the very least it kept moving smoothly forward, which is always nice. Aside from that, though, this debut novel really didn’t tick many boxes for me. I feel like the plot was lacking in enough detail that I almost felt insulted by the oversimplification of things. An entire community of selfless people? Meh. An entire community of people focused solely enough on education and brilliance that it’s their ONLY outward personality trait? Hrm. Nothing really fits. Nothing makes sense, and because of that it doesn’t seem all that well thought out. Aside from that, however, and since I’m writing this review after having read Insurgent and Allegiant, the story DOES get better as it goes along. So, read the book. Definitely check it out from the library first, though, then decide on whether or not it’s a must have in your personal library.